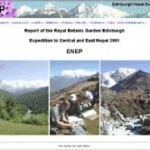 On-line report of the Royal Botanic Garden Edinburgh Expedition to Central and East Nepal 2001 (ENEP, left). This is available on the Royal BotanicGarden Edinburgh website. This page was established to bring together information and advice on field-based research. It is a Wikipedia style page, meaning that anybody can register to update, add or pose questions about Botanical field work.